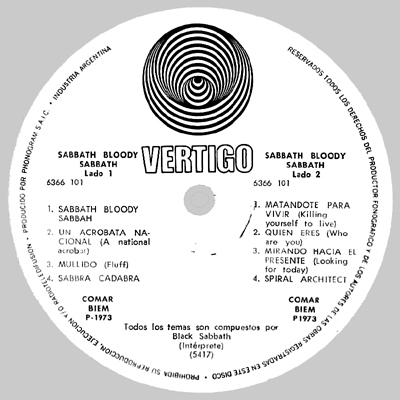 Argentinian Vertigo released quite some British albums, most of which have slight differences to the native issues. 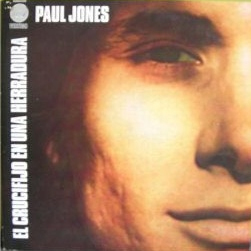 Mostly this concerns the songtitles, which often were translated into Spanish. A rather bizarre release was also found (see further below). Matrix numbers are machine-stamped in a characteristically broad font and hold only information about the catalogue number and side. 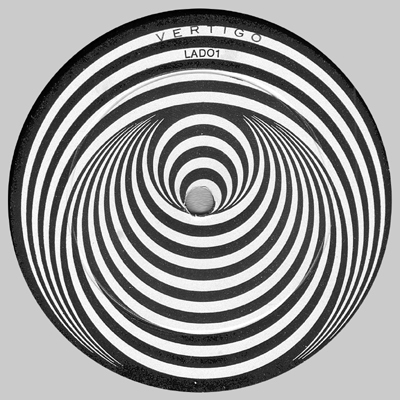 The A-side label in Argentina has ''Vertigo'' in the first white circle and ''Lado 1'' on the second. 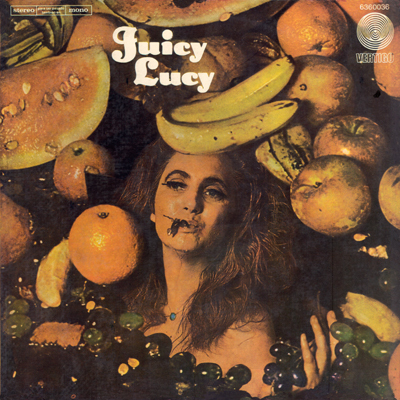 Photography and cover-design by unknown. A record with catalogue number 6360 035 was assumed to belong to a shelved project, although no one seemed to know what that project could have been. Above scans make it clear that this probably was not the case. 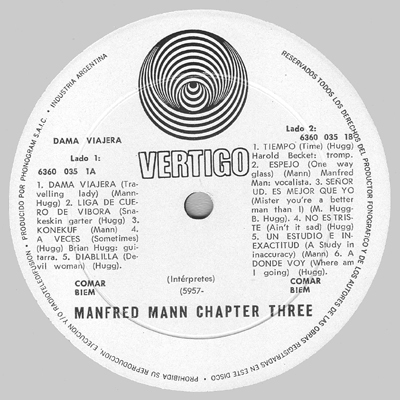 The contents are identical to VO 3 in Britain, Manfred Mann Chapter Three's self-titled debut, but the songtitles are translated into Spanish both on the backcover and the label. 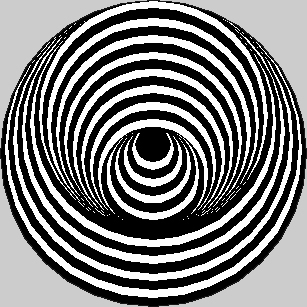 The album is titled after the opening track. 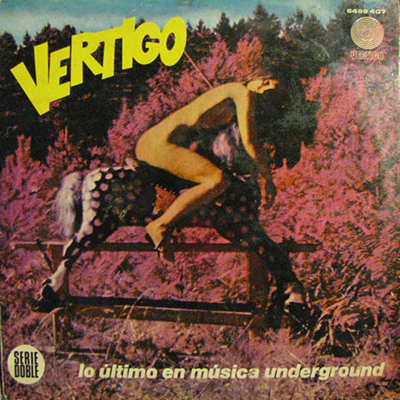 Obviously judging the UK cover too obscene, Vertigo in Argentina replaced its design with the (milder) Dutch one. 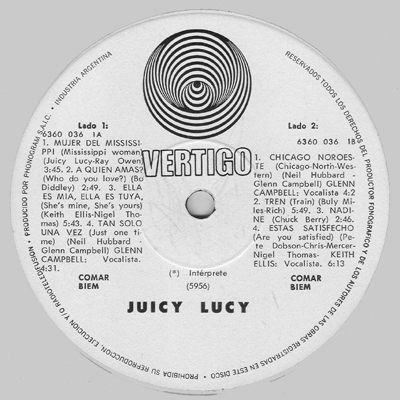 The gatefold was reduced to a single cover and the information was transferred to the back. 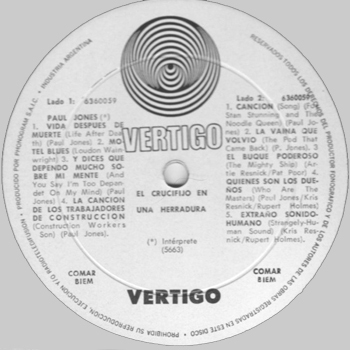 Songtitles are in Spanish on both the label and the cover. The contents are identical with the British VO 2. Just like in Brazil, this was issued belatedly in Argentina, after the succes of Paranoid. Please refer to the Brazil page. 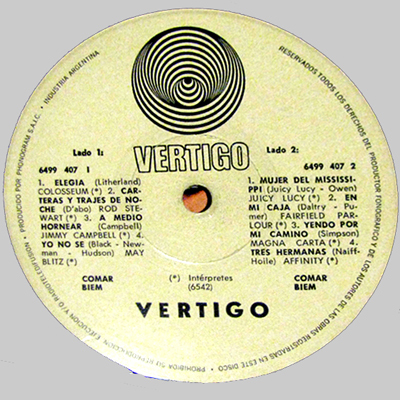 In Argentina the recording information, including translations of the titles into Spanish, was relocated to the back cover, since the gatefold cover was sacrificed. 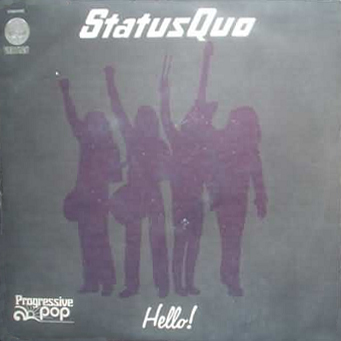 The front cover was adorned with a Union Jack at the bottom left hand corner. The reproduction of the artwork was very carelessly executed. A retitled release (Crucifix in a horseshoe), with adapted cover art. Blue for you was retitled too and the cover was slightly adapted. We also know that 6360 088 was assigned to the Spencer Davis Group, Gluggo. 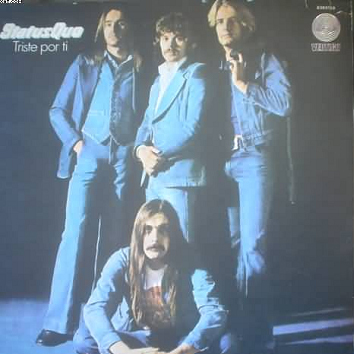 This record is reviewed on the first German albums page. We only got a scan from one of our readers, so we cannot give you any further details. This release seems to follow the UK issue with some of the titles translated into Spanish. 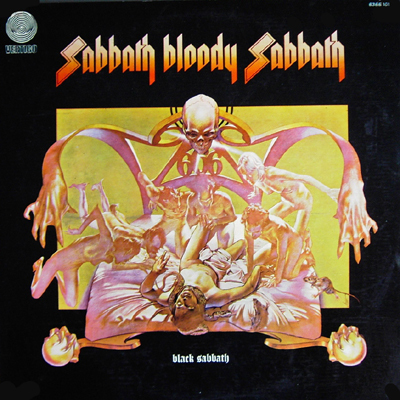 There is no evidence of any tampering with the cover image to champion decency, as was done in Uruguay. We have received confirmation of the following differing singles from Argentina. None were spotted in a picture sleeve. A: Espejo (One way glass). B: ¿Non es triste? (Ain't it sad). A: Mujer del Mississippi (Mississippi woman). B: ¿A quien amas? (Who do you love). Also spotted as a promo. A: La muchacha del telefono (Telephone girl). B: Esperare por ti (I'll wait for you). A: En el rebote (Catch me on the rebop). B: El borde (The edge). A: El malo Leroy Brown (Bad bad Leroy Brown). B: Un par de mesos menos (One less set of footsteps).